There was a time when it was considered unlikely, if not impossible, that anyone but an American would play jazz well. For the first few years after World War II, most of the jazz that came out of Europe seemed to justify that presumption. That era is gone and the list of fine jazz players from Europe, and more recently from Japan, is impressive. Jazz has become an international language, and there is nothing odder about a European jazz pianist than there is about an American symphony conductor. 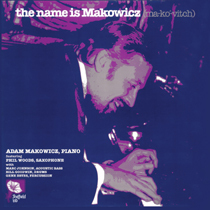 One of the finest jazz pianists Europe has produced is Adam Makowicz. The name is pronounced Ma-KO-vitch, the w being pronounced as v (which is so in probably every western language except English) and the cz as ch, as in Czechoslovakia, where in fact Adam Makowicz was born on August 18, 1940. Astrology buffs may wish to make something of the fact that Bill Evans was born August 15 and Oscar Peterson August 16. Adam's family moved to Poland when he was quite young and he studied at the Chopin Secondary School of Music in Krakow, after initial training by his mother. Jazz caught his interest early. From the moment he ventured out of Poland, Makowicz has dazzled the European jazz community. His reception is the United States has, up to the time of this writing, been somewhat more tempered. Part of the problem, in my opinion, has lain in his first American recordings, made on minimal budgets and presenting him solo or in duo. This recording presents Adam Makowicz in a setting suitalble to his talent. It arose out of the second Ojai jazz festival, which I co-produced in the late summer of 1982. Adam played on the Sunday afternoon, August 15---three days before his birthday. Lincoln Mayorga, himself a formidable pianist, was in the audience, and said to me without any ifs or maybes that he would like to record Adam direct to disc for Sheffield Lab. He asked me to introduce him to Adam, which I did, backstage. And then Lincoln had a very good idea: he wanted to record Adam with Phil Woods, who had played in the festival the night before. Phil Woods hardly needs endorsement. He has emerged as one of the major statesmen of jazz. Suffice it to say that in the twenty-five years I have known him, Phil has always represented to me some sort of measure of integrity. He plays always a fierce and fiery truth, no matter the fads of the moment. And that made the project all the more interesting: aside from the fact that no recording Adam has made in America, until this one, has offered him adequate acoustic circumstances, he hasn't recorded here with a horn player either. Here he's heard with one of the best. Their cohorts include Bill Goodwin, the drummer with Phil's quartet, bassist Marc Johnson, and percussionist Gene Estes. There is another dimension of Makowicz's prodigious talent that comes to the fore in this recording: his writing. With the exception of Cole Porter's "You Do Something To Me", all the tunes are Adam's own. His compositions have a special and interesting flavor. Finally, there's the quality of the recording. Sheffield Lab was of course the pioneer in modern direct-to-disc analogue recording, a process hard on the musicians in the sense that recording without editing is merciless. But the result, with musicians of this caliber, is remarkable, and all the intensity of the sessions is caught and preserved here. This is Adam Makowicz as he has never before been heard on records.